This web site is dedicated to the preservation of the spirit of Tang poetry. Li Bai has perhaps the purest lyric voice of any poet who ever dipped quill or feather or brush into ink well. He wrote in the manner of a great nature poet. And he wrote with the easy self-confidence of a great spiritual being, enough so that he earned nicknames from his contemporaries, such as the Exiled Immortal and the Transcendent from Heaven. As I hope you can tell in some of the translations of his poems below, he could easily wrap the natural and spiritual together in a few brief stanzas better than any other man of his or any other time. 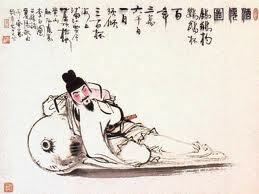 Li Bai wrote many poems, more than 1,000 of which have been passed down to us today. Here's a small selection, which I hope illustrates how his voice still calls out lout and clear through a range of moods and lyrics, whether composed at night in a mountain temple, or stumbling drunkely upstream in search of the moon.